Today's outing was planned to coincide with the Chinese Lunar New Year Celebration at International District Chinatown. The day started quite nice with a little bit of sunshine. We met up at Hing Hay Park just as the celebration kicked off with firecrackers and the famous lion dance. One of my goals was to catch and sketch the dancers, but I just couldn't get a good view amidst all the people who got there before me. After a few failed attempts, I decided to walk around the block and came across the Chong Wa Benevolent Association's building. I figured a quick sketch of the roof and brick details would be a good warm up to start the day. The weather started to turn as the sun disappeared behind thick cloud. Throngs of people started to fill the streets. I stood in the middle of King Street looking west to capture the festivities. As you can see, sketching to me is much less about accuracy or precision, and more about capturing the essence of time and place. 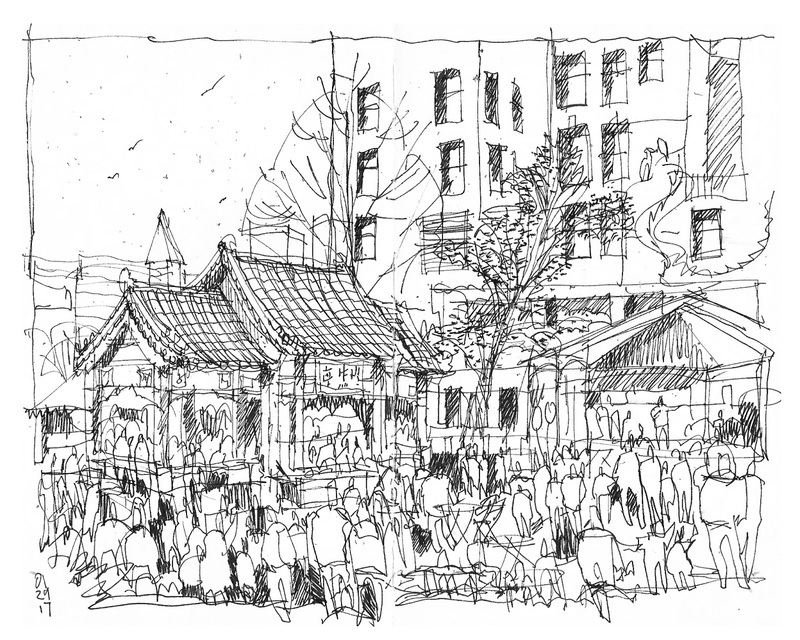 I went back to Hing Hay Park and sketched the scene around the pavilion and the main stage. At this point it got fairly chilly and my fingers started to get numb. I finished a quick one and joined fellow sketchers to warm up and share sketches at a nearby coffee shop. 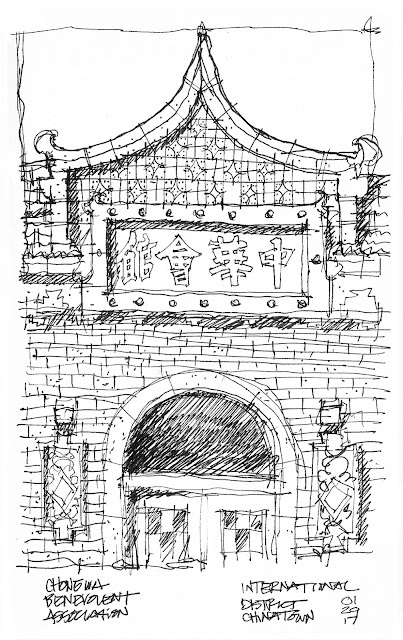 Gong Xi Fa Cai from Urban Sketchers Seattle family! 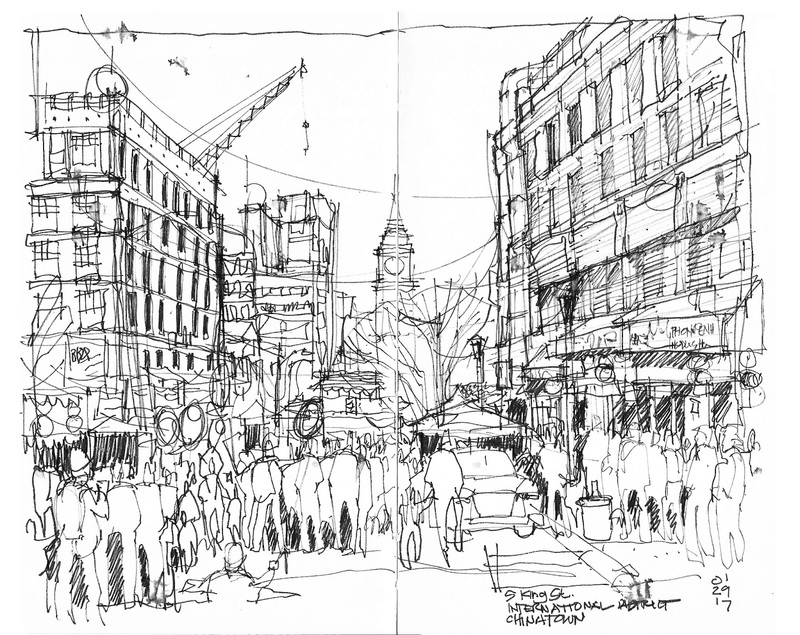 Great sketches, Andika! Especially the middle one -- I'm impressed by how much you were able to put in, and with such detail! It was fun to be able to sketch while standing in the middle of the street! Thank you Tina. It was fun chatting with folks wanting to know what I was doing. You have got a great hand. These are lovely sketches. thanks,gail! looking forward to see your sketches! Wonderful sketches, your line is great and is so confident and quick! Well done!